Standing stone at Puidrac, Balquidder. A standing stone stands about 4 1/2feet above ground, below Tom na Croich, Balquhidder. It is wedge-shaped, quite flat on top, and was famous as the place where trials of strength took place. 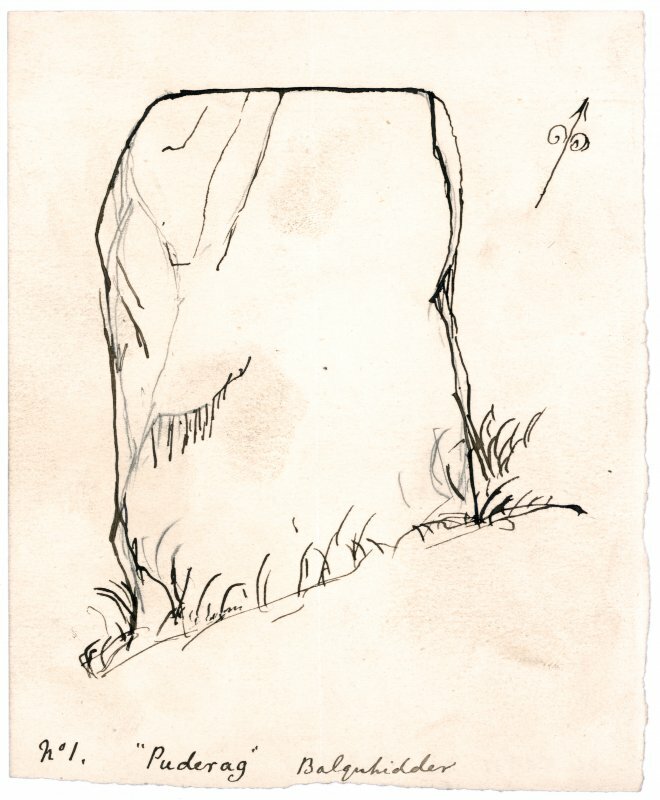 A large, round, water-worn boulder, named, after the district, 'Puderag', weighing 2-3cwt., had to be lifted and placed on top of the standing stone. The latter had a ledge on its east side which was used as a resting-place in the lift but it was broken off c.30 years ago. A former minister of the parish is reputed to have had the lifting-stone thrown into the river, due to the danger of the feat, but it is also said to have been built into the manse dyke. This stone, oriented E-W, is 1.25m high, 0.9m wide and from 0.2m to 0.4m thick. Visited by OS (W D J) 27 November 1968. NN 540 207 This slab measures 0.9m broad and up to 0.4m thick and stands to a height of 1.2m. Visited by OS (B S) 20 March 1979.